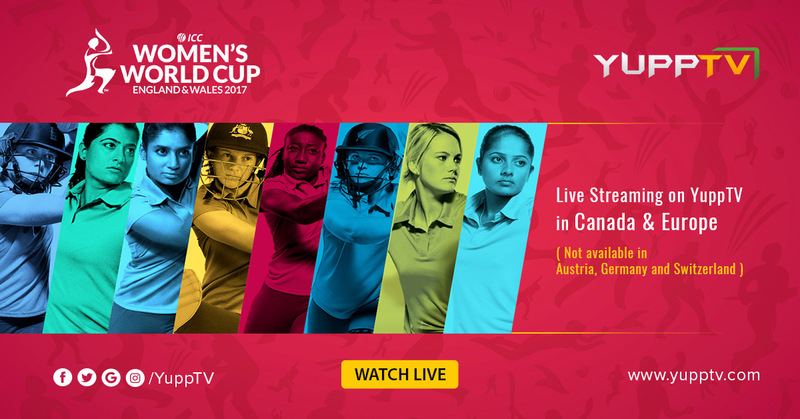 23rd June 2017: The world’s largest OTT provider of South Asian Content, YuppTV, proudly announces the acquiring of rights to stream ICC Women’s World Cup in Continental Europe (excluding Germany, Switzerland and Austria) and Canada. The tournament, to be commenced from 24th June 2017 will be held in England till 23rd July 2017. All the YuppTV users can now enjoy the ICC Women’s World Cup Live streaming seamlessly on their Smart TVs, PCs, Laptops, Smartphones, Tablets and other internet enabled devices. The first match which is to be held on 24th June, Saturday, is between New Zealand Women and Sri Lanka Women and is going to take place in the County Ground Bristol. England Women will be playing India Women on the same day at County Ground, Derby. Both the matches and the rest, will be streamed live at 15:00 PM IST on YuppTV. Eight of the World’s best Women’s Cricket teams will be playing for the trophy in ICC Women’s World Cup 2017, of which 4 teams specifically Australia, England, New Zealand, and West Indies authoritatively qualified from the ICC Women’s Championship between 2014- 2016 and the latter 4 teams (India, South Africa, Sri Lanka, and Pakistan) earned their right to enter after the World Cup qualifier 2017, held in Sri Lanka. Australia which won 6 of the 10 World Cups conducted till date will be entering the tournament as the defending champions. New Zealand who has bagged 1 trophy is another strong team to enter as favorites. India victorious in the last two tournaments before this ICC Women’s World Cup is fully strengthened and is expected to deliver an element of surprise. The Indian team led by Mithali Raj, aged 34, has a lot of young players in the team. Players like Harmanpreet Kaur, Shikha Pandey along with Jhulan Goswami are the strength of the Indian team. The tournament will take place between June 24th and July 23rd. The matches will be conducted in 5 venues across England namely County Ground (Derby), Bristol County Ground (Bristol), Grace Road (Leicester), County Ground (Taunton) and the final match will take place at Lord’s (London). The ICC WWC Live is the latest favorite sport on the television and web and will gather a lot of viewers in India and overseas. All the matches in ICC Women’s World Cup Live will be streamed exclusively on the YuppTV App on Smart TVs, or other internet enabled devices in Continental Europe (Except Germany, Austria, and Switzerland) and Canada.